Windows 8 sports a re-imagined desktop and tablet user interface with touch friendly Metro looks. One of the major changes in Windows 8 for a common users is the lack of start menu, with which we got friended for more than a decade. On Windows 8 we would be missing it. With the help of keyboard shortcuts you can navigate to Power options of Windows 8. Press Win + C to bring the Settings Charm and use Arrows and Enter keys to navigate to access Shutdown menu. This is one of the easiest way to shutdown the PC without using Mouse. If you don’t like to go through the Setting menu, you can use the traditional Run commands. 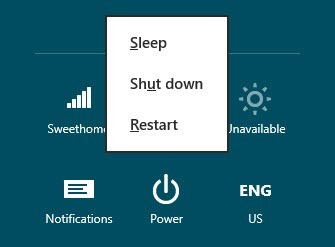 Press Win + R to open Run dialog and enter the command shutdown -s -t 0 to immediately shutdown the PC.